With the duties and order of 'Discoveries and Findings of the Universe' Department under the 'World Section' on Mars, I'm travelling around the world to know more about the water, rivers and oceans. Right now, I'm in Bagan, Myanmar, the country where the King Anawrahta built with love, sweat, tears, perseverance and others that could not be mentioned by words. One thing that catch my attention other than anything else in Bagan is Ayeyarwady River. 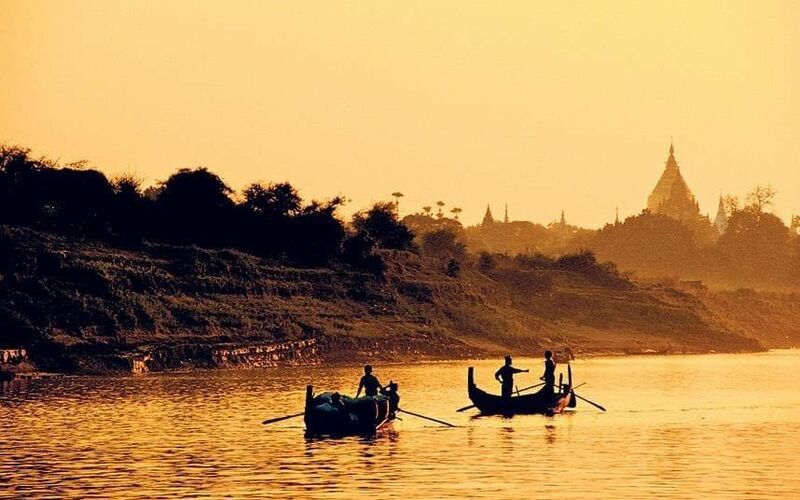 The Ayeyarwady river is popular and famous than ever. It can easily be seen on social media, news headlines and blogs. I have found many poems, articles and images that described the beauty and importance of Ayeyarwady river and Bagan. I couldn't wait to see Ayeyarwady river, the lifeblood of Myanmar. By looking at the river and its beauty, I now understand why King Anawrahta built the first city of Myanmar in this river bank,"
Dear His Majesty, I have seen the air view of Ayeyarwady river as it snaked and weaved over the landscape. After arriving in Bagan, I walked through to the river bank. Wow.. . . There she is, the wide, busy and flowing river. I remember how National Geographic Magazine mentions the river. Let me paraphrase here, "These waters speak of glacial beginnings in the snow-covered peaks of the Himalaya below Tibet. They have surged through the jungle-covered highlands to emerge in the sun-scorched plains of central Myanmar, where they will continue to the ocean, releasing finally into the Andaman Sea." Now, it is the dry season, she is portraying the beauty of summer and I cannot keep myself from imagining of her when the summer deluge of big rains would come. Oh. . .. I'm meeting with the lifeblood of Myanmar. I'm overwhelmed and to say truthfully, it certainly is a strong emotional moment for me. His Majesty, by looking at the river and its beauty, I now understand why King Anawrahta built the first city of Myanmar in this river bank. The importance and benefits of the exposed floodplains in this dry zone is the vital thing we cannot leave to appreciate. Busy with crops and people opportunistically growing in the dry season window.The generous Ayeyarwady river annually share its deposits of sediments and nutrients on the floodplain and this has been a centuries long tradition of allowing dry season food to be produced. Also, Ayeyarwady river is the home for many species. Various and plenty of aquatic life is happening beneath the water. Boats are going around and many fishermen busy with their regular routines. On the surface the various birds are skimming past and they dart and turn and create a vibrant feeling. On the edges of the river - I am impressed to see a mix of slim long birds who must be fish hunters in their own right. The sun is saying goodbye to the world. The scene is like a painting and the colours, river, its ecosystem and the nature made me speechless for a while. Human Species used to say that the ugly and the beauty always exist together. Though enjoying the beauty of the river, it is quite startling to see patches of raw sewerage floating in clumps down the river- which does take away some of the charm at those instances. In many places, people are washing their clothes, bathing and even cooking with this river water. The proper collection and treatment systems are in need for the local communities, His Majesty. The river itself has a constant and strong flow. The turbid brown colour was consistent all along - indicating that it is being fed with sediment and I am sure much sediment already in the river is constantly being churned up and resuspended. On the certain place in the river, I have seen the busy river sediment and bed extraction site. It is a stark contrast to the other river activity and created a very industrial landscape. The oozing sediment and surplus water feeding back across the stockpiles made for a sense that new land was being made - and maybe this was another side product on this moonscape activity that was underway. My noble Lord, His Majesty, to give opinion based on my studies on the rivers and water all my life, Ayeyarwady river is needed to sustain for the sake of nature, the future growth and development of Myanmar. The most important need is that the flow regimes are not interfered with. In the upper catchments, there are already major dams being fed by tributaries-but the balance cannot be lost and flows into the river need to be sustained and follow the natural rhythms. Also, Ayeyarwady river is indispensable for the economy. It generously gives the fish and rice to the public, and let the transportation of goods and people up and down through her. There are river traffic problems in the dry season where loss of flow mean boats are becoming stranded - with consequential delays and extras costs to this vital transport corridor. The agreed plan - needs much work so that all users and planners understand the multi uses and how the best balance can be struck. And maybe as I spent a day steadily moving from Bagan to Mandalay - then many of the users and decision makers can also come together on a steady day of contemplation so the immense value and beauty of the Ayeyarwady is retained and enhanced. If the chance knocks me to express these opinions to Myanmar people, I would gladly show my thoughts. Let us be together on the one boat - as the journey then will be fulfilling for all. Special thanks to Mr.Piet Filet for his generous support, sharing everything and time.